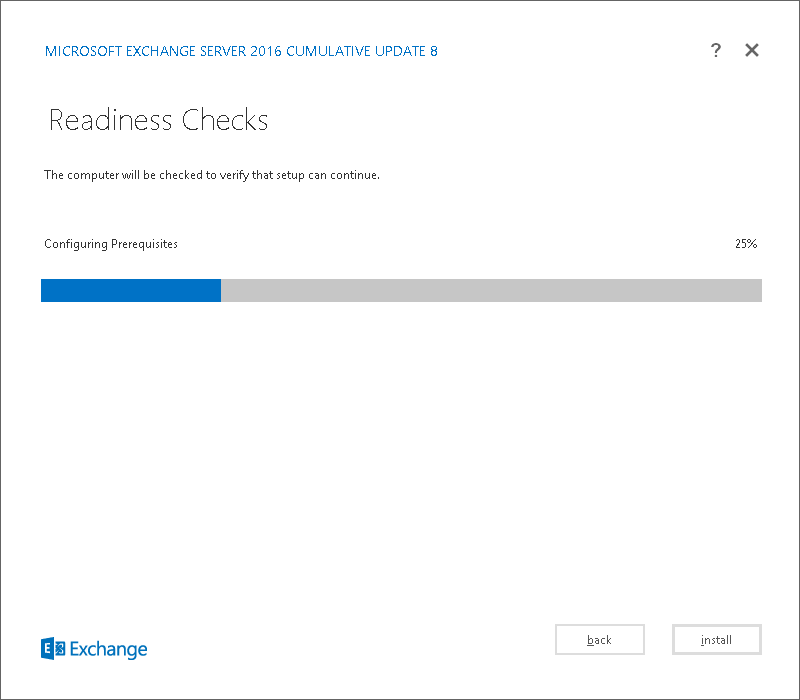 Just recently I ran into an error during initial setup of Exchange 2016 on a newly installed Windows Server 2012 R2 stating: “Service ‘MpsSvc’ failed to reach status ‘Running’ on this server“. 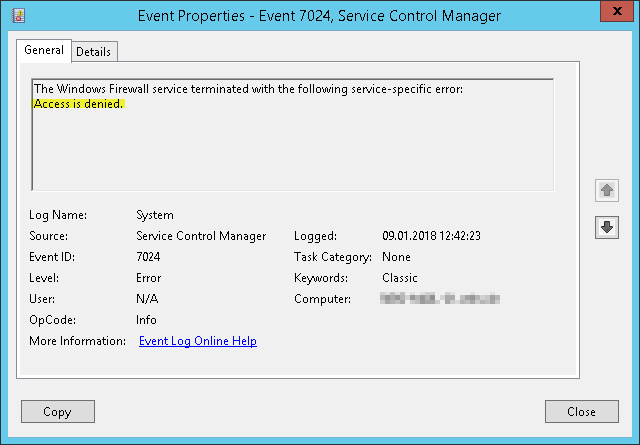 Further down the troubleshooting road I found out that this quite common error of not being able to start the Windows Firewall service is not Exchange Server specific. [01.09.2018 13:22:39.0123]  [WARNING] Service checkpoint has not progressed. Previous checkpoint=’0′- Current checkpoint=’0′. [01.09.2018 13:22:39.0138]  Previous service status query time is ‘09.01.2018 14:22:39’. [01.09.2018 13:22:39.0138]  Current service status query time is ‘09.01.2018 14:22:39’. [01.09.2018 13:22:39.0138]  Will wait ‘2000’ milliseconds for the service ‘MpsSvc’ to reach status ‘Running’. [01.09.2018 13:22:41.0260]  Service ‘MpsSvc’ failed to reach status ‘Running’ on this server after waiting for ‘2000’ milliseconds. [01.09.2018 13:22:41.0260]  [WARNING] Service checkpoint has not progressed. Previous checkpoint=’0′- Current checkpoint=’0′. [01.09.2018 13:22:41.0260]  Previous service status query time is ‘09.01.2018 14:22:39’. [01.09.2018 13:22:41.0260]  Current service status query time is ‘09.01.2018 14:22:41’. [01.09.2018 13:22:41.0260]  Will wait ‘25000’ milliseconds for the service ‘MpsSvc’ to reach status ‘Running’. [01.09.2018 13:23:06.0494]  Service ‘MpsSvc’ failed to reach status ‘Running’ on this server after waiting for ‘25000’ milliseconds. [01.09.2018 13:23:06.0494]  [WARNING] Service checkpoint has not progressed. Previous checkpoint=’0′- Current checkpoint=’0′. [01.09.2018 13:23:06.0494]  Previous service status query time is ‘09.01.2018 14:22:41’. [01.09.2018 13:23:06.0494]  Current service status query time is ‘09.01.2018 14:23:06’. [01.09.2018 13:23:06.0494]  Will wait ‘25000’ milliseconds for the service ‘MpsSvc’ to reach status ‘Running’. 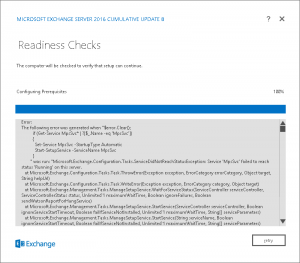 ” was run: “Microsoft.Exchange.Configuration.Tasks.ServiceDidNotReachStatusException: Service ‘MpsSvc’ failed to reach status ‘Running’ on this server. 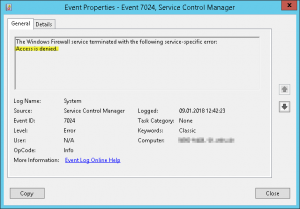 Windows could not start the Windows Firewall on Local Computer. For more information, review the System Event Log. 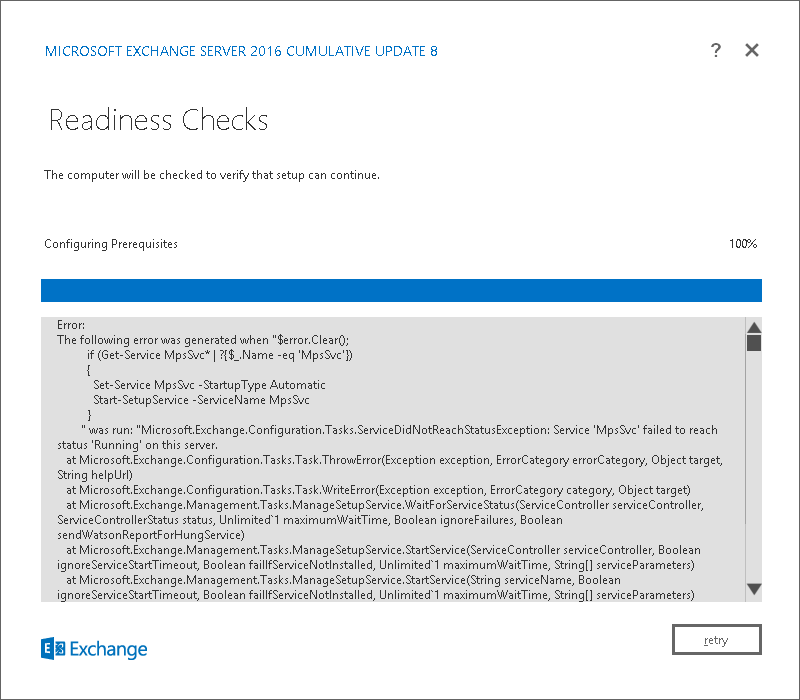 If this is a non-Microsoft service, contact the service vendor, an refer to service-specific error code 5. 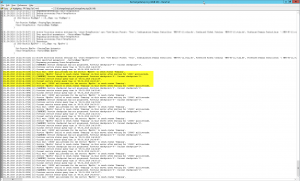 An Event entry with ID 7024 is logged once more. 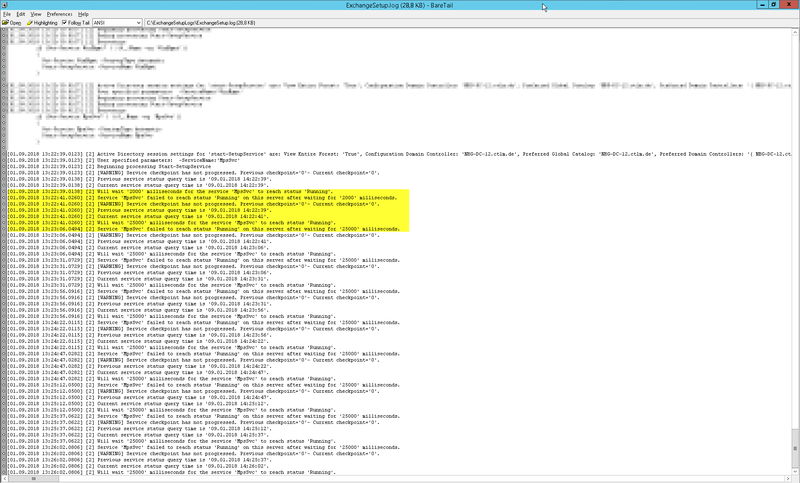 To make a long story short: missing or wrong permissions on either Registry and/or Windows Services are not the issue here. 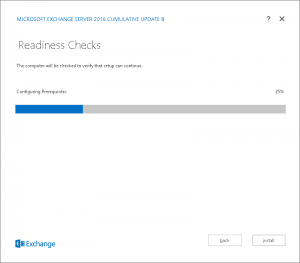 Exchange 2016 requires the full installation of Windows Server (in 2016, it’s called Desktop Experience), and isn’t explictly supported for installation on Server Core. Quite tedious, but it seemed to work. We’ve seen the similar symptons. Please try manually create the following registry key, and then test to see if Windows Firewall can be started.